Quarterly results for computing and tech services giant IBM just crossed the wires and they’re below expectations. Earnings on a per-share basis were $3.00 on sales of $23.4 billion, well below the consensus view of analysts who had forecast $3.05 on sales of $24.7 billion. IBM shares fell by nearly 4 percent in after-hours trading. The results will likely weigh on the broader markets tomorrow. The weakness appears to be similar to something Oracle said about its most recently reported quarter. In the statement below, CEO Ginni Rometty said several deals that would have otherwise closed in the first quarter both in hardware and software slid into the second quarter. Here’s another reason for the miss: Global Technology Services revenue at $9.6 billion fell by 4 percent year on year, or 2 percent after adjusting for currency fluctuations. Global Business Services, at $4.5 billion, fell 3 percent, or were flat after adjusting for currency effects. Sales were off in every geographical region: By 7 percent in the Asia Pacific region, and by 4 percent each in the Americas and in Europe-Middle East-Africa. There were bright spots. Software segment sales were flat at $5.6 billion, or up 1 percent after adjusting for currency versus the year-ago quarter. I guess flat is the new up. Even so, IBM hasn’t seen fit to adjust its full-year guidance, which calls for per-share earnings of $16.70. Either way, that’s a pretty substantial miss on both the EPS and revenue lines. It’s rare for IBM to come in with revenue that’s more than a billion dollars off the consensus. Here’s IBM’s announcement. I’ll have more as I go through it. The company is going to discuss the results on a conference call shortly. Reiterating full-year 2013 operating (non-GAAP) EPS expectation of at least $16.70. 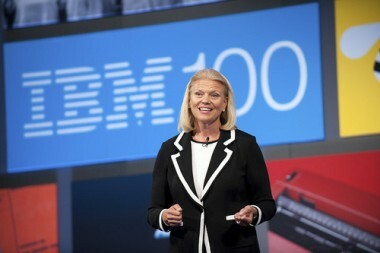 IBM (IBM) today announced first-quarter 2013 diluted earnings of $2.70 per share, a year-to-year increase of 3 percent. Operating (non-GAAP) diluted earnings were $3.00 per share, compared with operating diluted earnings of $2.78 per share in the first quarter of 2012, an increase of 8 percent. First-quarter net income was $3.0 billion, down 1 percent year-to-year. Operating (non-GAAP) net income was $3.4 billion compared with $3.3 billion in the first quarter of 2012, an increase of 3 percent. Total revenues for the first quarter of 2013 of $23.4 billion were down 5 percent (down 3 percent, adjusting for currency) from the first quarter of 2012. “In the first quarter, we grew operating net income, earnings per share and expanded operating margins but we did not achieve all of our goals in the period. Despite a solid start and good client demand we did not close a number of software and mainframe transactions that have moved into the second quarter. The services business performed as expected with strong profit growth and significant new business in the quarter,” said Ginni Rometty, IBM chairman, president and chief executive officer. First-quarter operating (non-GAAP) diluted earnings exclude $0.30 per share of charges: $0.12 per share for the amortization of purchased intangible assets and other acquisition-related charges, and $0.18 per share for retirement-related charges. IBM is reiterating its expectation for full-year 2013 GAAP diluted earnings per share of at least $15.53. Operating (non-GAAP) diluted earnings per share expectations remain at least $16.70. The 2013 operating (non-GAAP) earnings expectations exclude $1.17 per share of charges for amortization of purchased intangible assets, other acquisition-related charges, and retirement-related charges. The Americas’ first-quarter revenues were $10.0 billion, a decrease of 4 percent (down 3 percent, adjusting for currency) from the 2012 period. Revenues from Europe/Middle East/Africa were $7.3 billion, down 4 percent (down 4 percent, adjusting for currency). Asia-Pacific revenues decreased 7 percent (down 1 percent, adjusting for currency) to $5.7 billion. OEM revenues were $426 million, down 16 percent compared with the 2012 first quarter. Revenues from the company’s growth markets decreased 1 percent (up 1 percent, adjusting for currency). Revenues in the BRIC countries — Brazil, Russia, India and China — decreased 1 percent (up 3 percent, adjusting for currency). Global Technology Services segment revenues decreased 4 percent (down 2 percent, adjusting for currency) to $9.6 billion. Global Business Services segment revenues were down 3 percent (flat, adjusting for currency) to $4.5 billion. Pre-tax income from Global Technology Services was up 7 percent and pre-tax margin increased to 16.1 percent. Global Business Services pre-tax income increased 17 percent and pre-tax margin increased to 15.1 percent. The estimated services backlog at March 31 was $141 billion, up 1 percent year over year at actual rates (up 5 percent, adjusting for currency). The company closed 22 service agreements of more than $100 million in the quarter. Revenues from the Software segment were flat at $5.6 billion (up 1 percent, adjusting for currency) compared with the first quarter of 2012. Software pre-tax income increased 4 percent and pre-tax margin increased to 31.5 percent. Revenues from IBM’s key middleware products, which include WebSphere, Information Management, Tivoli, Social Workforce Solutions (formerly Lotus) and Rational products, were $3.5 billion, up 1 percent (up 2 percent, adjusting for currency) versus the first quarter of 2012. Operating systems revenues of $578 million were down 2 percent (down 1 percent, adjusting for currency) compared with the prior-year quarter. Revenues from the WebSphere family of software products increased 6 percent year over year. Information Management software revenues decreased 2 percent. Revenues from Tivoli software increased 1 percent. Revenues from Social Workforce Solutions (formerly Lotus) software increased 8 percent, and Rational software decreased 2 percent. Revenues from the Systems and Technology segment totaled $3.1 billion for the quarter, down 17 percent (down 16 percent, adjusting for currency) from the first quarter of 2012. Excluding Retail Store Solutions (RSS), revenues were down 14 percent (down 13 percent, adjusting for currency). Systems and Technology pre-tax loss increased $0.3 billion. Total systems revenues, excluding RSS, decreased 13 percent (down 13 percent, adjusting for currency). Revenues from System z mainframe server products increased 7 percent compared with the year-ago period. Total delivery of System z computing power, as measured in MIPS (millions of instructions per second), increased 27 percent. Revenues from Power Systems were down 32 percent compared with the 2012 period. Revenues from System x were down 9 percent. Revenues from System Storage decreased 11 percent. Revenues from Microelectronics OEM decreased 16 percent. Global Financing segment revenues were up 2 percent (up 4 percent, adjusting for currency) in the first quarter at $499 million. Pre-tax income for the segment increased 5 percent to $538 million. The company’s total gross profit margin was 45.6 percent in the 2013 first quarter compared with 45.1 percent in the 2012 first-quarter period. Total operating (non-GAAP) gross profit margin was 46.7 percent in the 2013 first quarter compared with 45.7 percent in the 2012 first-quarter period, with increases in Global Technology Services and Global Business Services. Total expense and other income decreased 3 percent to $7.1 billion, compared to the prior-year period. S,G&A expense of $5.6 billion decreased 5 percent year over year. R,D&E expense of $1.6 billion increased 3 percent, compared with the year-ago period. Intellectual property and custom development income decreased to $183 million compared with $255 million a year ago. Other (income) and expense was income of $60 million compared with prior-year income of $58 million. Interest expense decreased to $94 million compared with $110 million in the prior year. Total operating (non-GAAP) expense and other income decreased 4 percent to $6.9 billion compared with the prior-year period. Operating (non-GAAP) S,G&A expense of $5.4 billion decreased 7 percent compared with prior-year expense. Operating (non-GAAP) R,D&E expense of $1.6 billion increased 1 percent compared with the year-ago period. Pre-tax income decreased 6 percent to $3.6 billion. Pre-tax margin decreased 0.1 points to 15.4 percent. Operating (non-GAAP) pre-tax income decreased 1 percent to $4.1 billion and pre-tax margin was 17.4 percent, up 0.8 points. IBM’s tax rate was 15.9 percent, down 4.1 points year over year; operating (non-GAAP) tax rate was 17.3 percent, down 3.2 points compared to the year-ago period. The lower tax rate is primarily due to benefits recorded to reflect changes in tax laws enacted during the quarter, including the reinstatement of the U.S. Research and Development Tax Credit. Net income margin increased 0.5 points to 13.0 percent. Total operating (non-GAAP) net income margin increased 1.2 points to 14.4 percent. The weighted-average number of diluted common shares outstanding in the first-quarter 2013 was 1.12 billion compared with 1.17 billion shares in the same period of 2012. As of March 31, 2013, there were 1.11 billion basic common shares outstanding. Debt, including Global Financing, totaled $33.4 billion, compared with $33.3 billion at year-end 2012. From a management segment view, Global Financing debt totaled $25.2 billion versus $24.5 billion at year-end 2012, resulting in a debt-to-equity ratio of 7.2 to 1. Non-global financing debt totaled $8.2 billion, a decrease of $0.6 billion since year-end 2012, resulting in a debt-to-capitalization ratio of 34.3 percent from 36.1 percent. IBM ended the first-quarter 2013 with $12.0 billion of cash on hand and generated free cash flow of $1.7 billion, excluding Global Financing receivables, down approximately $0.2 billion year over year. The company returned $3.5 billion to shareholders through $0.9 billion in dividends and $2.6 billion of gross share repurchases. The balance sheet remains strong, and the company is well positioned to support the business over the long term. Except for the historical information and discussions contained herein, statements contained in this release may constitute forward-looking statements within the meaning of the Private Securities Litigation Reform Act of 1995. Forward-looking statements are based on the company’s current assumptions regarding future business and financial performance. These statements involve a number of risks, uncertainties and other factors that could cause actual results to differ materially, including the following: a downturn in economic environment and corporate IT spending budgets; the company’s failure to meet growth and productivity objectives, a failure of the company’s innovation initiatives; risks from investing in growth opportunities; failure of the company’s intellectual property portfolio to prevent competitive offerings and the failure of the company to obtain necessary licenses; cybersecurity and data privacy considerations; fluctuations in financial results and purchases, impact of local legal, economic, political and health conditions; adverse effects from environmental matters, tax matters and the company’s pension plans; ineffective internal controls; the company’s use of accounting estimates; the company’s ability to attract and retain key personnel and its reliance on critical skills; impacts of relationships with critical suppliers and business with government clients; currency fluctuations and customer financing risks; impact of changes in market liquidity conditions and customer credit risk on receivables; reliance on third party distribution channels; the company’s ability to successfully manage acquisitions and alliances; risk factors related to IBM securities; and other risks, uncertainties and factors discussed in the company’s Form 10-Q, Form 10-K and in the company’s other filings with the U.S. Securities and Exchange Commission (SEC) or in materials incorporated therein by reference. Any forward-looking statement in this release speaks only as of the date on which it is made. The company assumes no obligation to update or revise any forward-looking statements. -adjusting for the divestiture of RSS. The rationale for management’s use of non-GAAP measures is included as part of the supplemental materials presented within the first-quarter earnings materials. These materials are available via a link on the IBM investor relations Web site at www.ibm.com/investor and are being included in Attachment II (“Non-GAAP Supplemental Materials”) to the Form 8-K that includes this press release and is being submitted today to the SEC. IBM’s regular quarterly earnings conference call is scheduled to begin at 4:30 p.m. EDT, today. The Webcast may be accessed via a link at http://www.ibm.com/investor/events/1q13.phtml. Presentation charts will be available shortly before the Webcast.